These small town values are what guides us today. This is our story along with our commitment to providing superior customer service. RVs are more than just a recreational vehicles, they are about memories. Fishing, hiking and tailgating with family and friends are just some of the experiences that will last in campers memories for years down the road. We know how dear those experiences are to our customers. That is why we work so hard to make those RV dreams come true. Our customers are diverse outdoor and sporting enthusiasts, young families, retirees, and everything in between. RVs have so many uses, so we continually strive to find just the right RV match. For us at Wilkins RV, the goal is to make the search for the perfect RV easy. It’s about listening to the customer, and finding the right features to fit those specific needs. Our job is not to sell an RV, it’s to help our customers find the right RV. We often get asked, what makes Wilkins RV different? To us, it’s longevity and that makes us proud. For 80 years, we’ve treated our customers fairly and held true to our values. That resonates with our customers. While many RV dealers have come and gone, we are still going strong. Our customers can take comfort in knowing that if they experience a problem, we will be here to take care of it. The most satisfying part of what we do, is knowing we’ve fulfilled a customer’s dream. 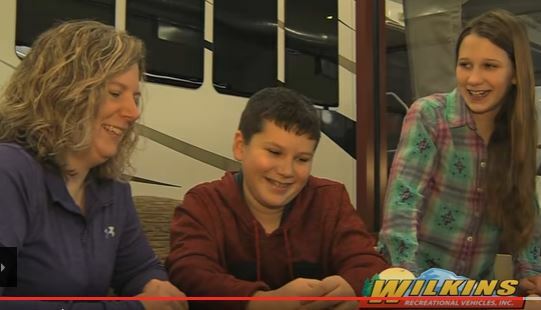 The smiling faces of the children and excitement of a new RV owner is what makes us most proud every day. Contact Us at Wilkins RV for any RV related questions or visit us at either of Our Locations for a personal tour. Let us help you get on the road to RV fun!